Please make sure to read the release notes with instructions that you’ll find near the bottom of this page! For an overview of changes since version 30 (currently 30.3) scroll to the bottom. 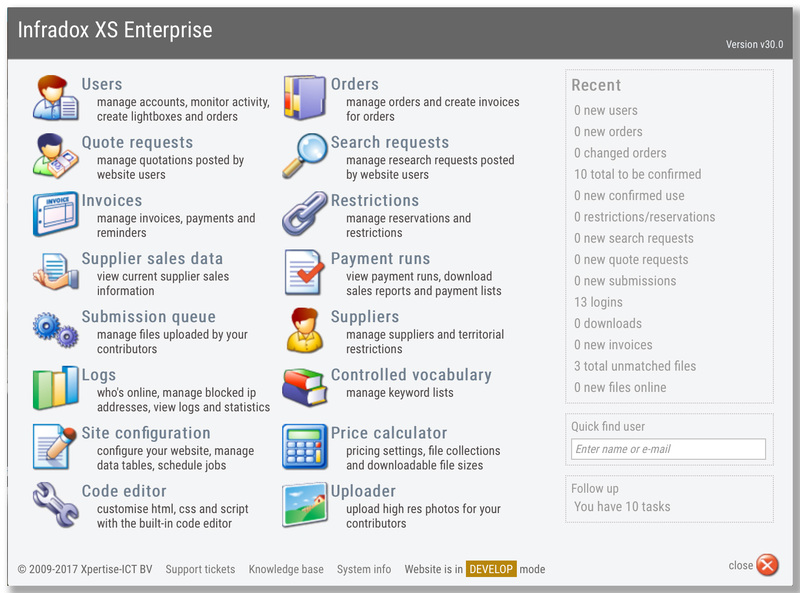 We have added several new settings to configure your sales reports (e.g. which fonts and font sizes, what to print and so on). You can now automatically process invoice payments from CSV files that you have exported from e.g. your accounting or banking software. You can now upload model release, property release and/or other documents linked to your files. A single release can be easily attached to many files if e.g. the release is for many photos from a same shoot. Several document types are supported, such as PDF, Word documents, text files, jpegs and so on. In addition to the available standard gallery layouts, you can now add your own custom layouts with the code editor. You can now choose between infinite scrolling and traditional pagination for gallery group pages. If you configure a group page to list galleries with traditional pagination, you can either style the default pagination bar with CSS or write your own by adding custom script. You can now switch to displaying larger thumbnails for all your pages, including Gallery group pages and Gallery pages. The Gallery manager now lets you change selected settings for all Galleries in a Group at once (e.g. mark all unpublished, change layout style for all in Group and so on). If there are important user or organisation notes, this is now clearly visible on other management pages (e.g. order management, invoice management and so on). We have rewritten most of the CSS used by backoffice for a smaller footprint, a more consistent look across all of the backoffice pages and dialogs, and to reduce the chance of problems caused by custom CSS with backoffice functions that are integrated in the client facing pages. We have moved several functions into a separate server application for improved performance. All backoffice functions now use the Roboto Condensed font. The new tasks function is integrated in the administrator dashboard. You can now upload fonts (Site configuration, Website files, Self hosted fonts). More information: Using fonts. The configured date format (Site configuration, General settings, User interface language, Country & Time zone) is now also used for the field “creation date” on thumbnail pages. We have added support for the Dreamstime API with access to well over 35 million Royalty Free images. Contact us for more information. The invoice configuration settings now use a macro to print address details. Configure this macro before you create invoices (site configuration > invoice settings). The sales reports now use a macro to print address details. Configure this macro before starting a Payment run (site configuration, sales reports settings). If you use a custom flow template, you must make a minor change. Please read Custom thumbnail templates to learn what you have to change. If you custom thumbnail templates and your site has video content, you must make a minor change to your templates, contact us for details. If you have made changes to the constants files listed below, then you must add new constants to your changed version of the file. Open the original file and scroll down to the line that reads ** version 30 **. Then copy the constants below this line and paste them at the bottom of your changed version. Fixed a problem with encrypted passwords that sometimes occurred when adding a new user from Back office, User management. Added columns api file ref, object name and original file name to the csv details export that you can download from Back office, Payment runs. Fixed problem with the search log which didn’t include searches by guests. Added a checkbox which lets you disable the browser’s “leave page” check on the upload pages. Added fields commissions, contact form, changeable properties, and statistics to the supplier group dialog so that these can be automatically applied to new suppliers in a group. Added supplier VAT/Tax numbers to contributor export in Site configuration, Job server. Added consolidated view (updated weekly) of most used search queries to Back office, Logs. Added the number of new contributors to the daily and weekly statistics so that you can see how many of the new users registered as a contributor. Added Apply buttons to the supplier group dialog so that you can update all suppliers in a group (i.e. royalties settings, new content settings, and contributor defaults. Fixed a problem with the supplier dialog that prevented resetting the payment periodicity to 0 (zero). Fixed a problem with the csv export of selected sales data in a supplier group in Back office, Supplier sales data. The label for custom field 3 in Site configuration, Website forms, User account labels wasn’t stored in the database, which has been fixed. Added payment run type for “affiliate agents”. Added additional layout options to the payment run sales reports, and columns are now automatically removed if all fields for a column are unselected. Fixed a caching related problem with the image type “illustration” filter. The controlled vocabulary now supports multiple locales. Added controlled vocabulary export and import functions to job server which lets you translate lists off-line. Added automatic translation of terms by use of the controlled vocabulary to the “Metadata processing” function.